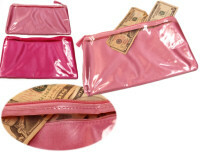 3 Part Large Pink or Hot Pink Everything Bags. The outer of the bag is satin on one side and clear plastic on the other. Zipper opens to reveal another zipper compartment that separates the outer bag into two compartments and the one in the middle makes three. Bag measures approx 5.5 x 10 inches. $5.00 each -or- $36.00 a dozen (Was $48.00 a dozen). Comments: I Love this for money,checks and receipts.The 3 sections are spacious.Very well Made.Sturdy.Great for an incentive gift!